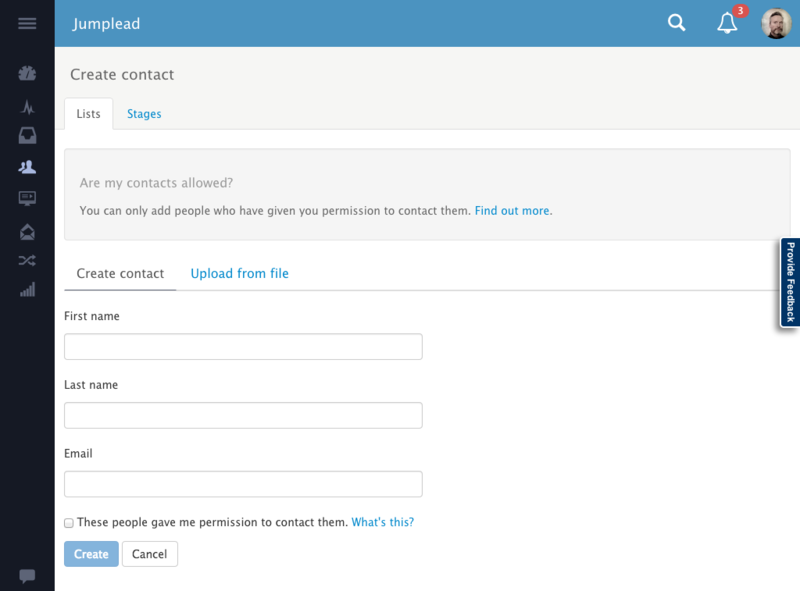 So if we go over to the button on the right hand side that says 'Add contacts', you'll see that you've got two options, you can either add them manually one at a time here, or you can upload your contacts as a CSV file. I'm going to do both. I'll start by adding a contact with their name and email address, click the button to confirm that the person has given us their permission to be contacted. And you can see that the contact has been created and this is where all of the activity will be recorded and Tasks and Notes can be set. So I'm going to pop a task in, as I need to call this guy back on Friday. So I'll create a new task called 'call back' and fill in the details for my task. When I add the date and time for the due date, I can also get a notification through into my diary if I complete the reminder option just below it. That will have dropped a task in for this particular contact, and there you can see that the task belongs to me and it's associated with this contact. It's also listed in the Tasks section at the top, where all of the tasks are displayed. So if we drop back over to the contacts section, you can see that my contact now exists within the system, also Jumplead has populated the social media accounts for that contact. What I'm going to do now is to import a CSV file which has a bunch of contacts in it. What I'll need to do is to firstly navigate to my CSV file, which I have here sitting on my desktop. What I'm going to do is to add a Tag which is useful later on if you want to segment your contacts in a specific way. What I'm going to do is to add the tag 'awesome' there, and I've got an option to either 'skip' or 'merge' with existing contacts. What that does is that if the contact exists and you skip, it will just pass it over, if you merge it will add and replace any information for that contact. Now, because Jumplead has taken a look inside that CSV file and worked out what fields you have in there, we just need to match them up with the fields that Jumplead knows about. So we'll hook those up there, first name, last name, email, telephone number, company etc. 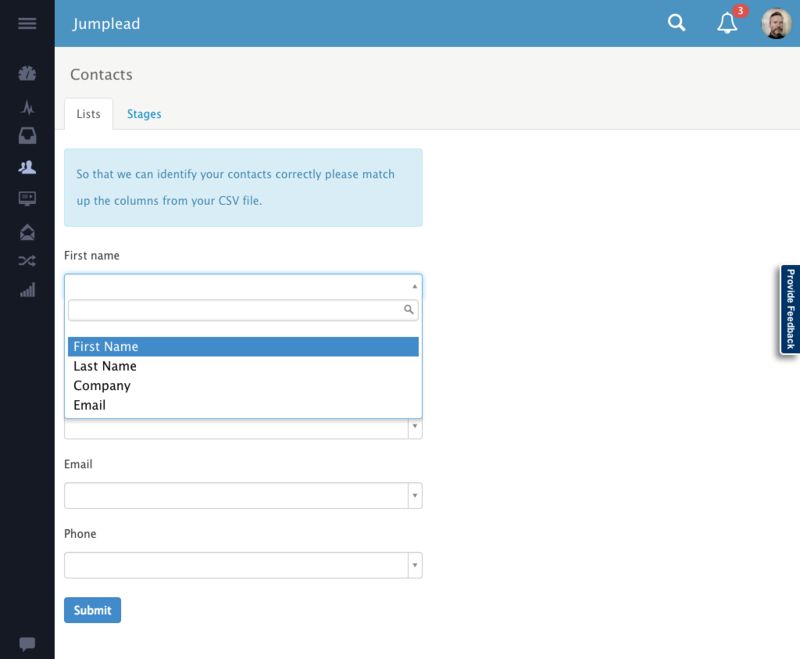 Also, if you have any custom contact fields that you've already added to Jumplead, or if you've got things in your CSV import that you want Jumplead to understand, if you add those in as custom contact fields you'll be able to match them up. So that's been imported. It's been added to a queue that Jumplead then processes, if we go over to the contact section you can see they've been imported. And Adam has been updated with the 'awesome' tag because we merged. If we click on the tag it's the same thing as filtering by the tag. You can see one contact has dropped out because they didn't have the tag. If you wanted to work with this particular segment of contacts in some way we can select them and there are options for things we can do such as run an automation. There we go, we've imported some contacts, added a task, and set a reminder!